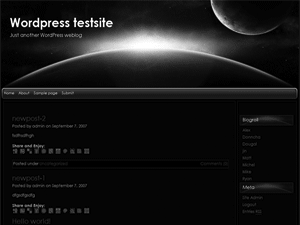 Galactica is a black wordpress template, featuring a rising sun over a misterious planet in it’s header graphics. It’s a 2 column wp theme made by web2feel.com. Left hand sidebar supports wordpress widgets (you just have to enable them in your blog’s admin area – under Appearance). This wordpress design is suitable for any type of blog – if you’re into black color.